The patent dispute about the revolutionary CRISPR-Cas9 gene-editing technology between the Broad Institute (jointly operated by Harvard and MIT) on the one side and UC Berkeley on the other side is of great interest in the biotech community. In the US, the Broad Institute prevailed in the interference hearing at the USPTO. The UC Berkeley has meanwhile filed an appeal to the CAFC. In Europe, the first patent of UC Berkeley has very recently been granted by the EPO. As in the US, however, the Broad Institute has been the first one to get a patent issued in Europe, namely EP 2 771 468. Against this patent, 9 oppositions have been filed, most of which appear to be so-called strawman oppositions. With office communication of April 19, the EPO has now scheduled oral proceedings at the EPO main building at 16 January 2018. In the preliminary opinion issued together with the summons to the oral hearing, the oppisition division takes the non-binding provisional view that the opposition is expected to be successful on the ground of added matter (claims 1 and 2) and the ground of lack of novelty (claims 1-6 and 9-17). Even though the EPO emphasizes the non-binding nature of such provisional opinions, it is in most cases very difficult for the party negatively affected by the opinion to reverse the view of the opposition division. It will thus be tough for the Broad Institute to repeat its success in the US in Europe. If a patent office fee is payed by a direct debiting mandate, the date of receipt of the mandate is according to § 2 No. 4 PatKostZV (Rules on payment of patent fees) regarded as the day of payment of the fee only if the mandated amount is withdrawn by the Federal Account on behalf of the Patent Office. According to this regulation the debtor alone bears the risk that, for whatever reasons, the amount is not withdrawn. This is true also if the amount has not been withdrawn because the Patent Office does not make use of the direct debiting mandate close to the due date. In the case to be decided by the court an opponent filed an opposition against a German patent on October 7, 2011, i.e. on the last day of the opposition period, and paid the statutory opposition fee of EUR 200 by means of a direct debit mandate. The GPTO, however, did not make use of the direct debit mandate, allegedly because it was not forwarded to the accounting office. Only after initiation of an insolvency procedure with respect to the opponent on November 25, 2011, which was communicated to the GPTO on December 6, 2011, did the GPTO accounting office take notice of the direct debiting mandate, but could no longer make use of it due to the insolvency. On December 20, 2011 (date of receipt) the opposition fee was paid to the GPTO by remittance with the authorization of the insolvency administrator. The GPTO decided on June 25, 2015 that the opposition is deemed not having been filed due to failure to pay the opposition fee within the prescribed deadline. According to the court, prereqisite of the “privileged” payment date of the receipt of the direct debit authorization is the actual withdrawal of the authorized amount by the GPTO. The withdrawal was no longer possible upon initiation of the insolvency proceedings on November 25, 2011. In the courtś view the fact that the GPTO had sufficient time to withdraw the money between October 7, 2011 and November 24, 2011 (i.e. about 7 weeks, whereas this procedure according to the statement of the GPTO typically takes about 2-3 weeks) does not change this general rule as long as by the delay general principles of the rule of law are not violated. The fact that the opponent is not responsible for these delays could only taken into account in abreinstatement procedure which, however, is not available in case of missing the opposition deadline. In addition, the court reasoned the opponent could use other possible payment methods avoiding this risk. The remittance received by the GPTO on December 20, 2011 was regarded as too late. The Federal Patent Court allowed further appeal (Rechtsbeschwerde) to the Federal Court of Justice (FCJ). I hope that the opponent will lodge further appeal with the FCJ and that the decision will be revised upon appeal. In my view, the decision unduely shifts the burden of the settlement risk of a payment of GPTO fees completely to parties of proceedings before the GPTO, be it opponents against a patent grant of a third party or patent applicants itself having to pay annuity fees or the like. This is true in particular for the formulation of the official headnote, which generalizes the individual case decided by the court to a general responsibility of parties before the GPTO using fee payment by direct debit authorization to bear the risk if any failure of the office to use the authorization to withdraw the fee. Strict deadlines in patent proceedings serve the purpose of legal certainty for the involved parties as well as for the public, e.g. the public has a right to know whether a patent grant has been opposed to or not. Strict deadlines for fee payments can serve the same purpose as in the case of annuity fees, where the public needs to know whether or not a patent lapses or not. Payment of procedural fees as filing fees, opposition fees etc., however, are irrelevant for legal certainty but mainly serve the purpose of contributing to the procedural costs of the office. Therefore it should be sufficient if the involved party of proceedings before the GPTO has timely and in accordance with the procedural rules initiated payment of the correct amount. Any delay caused by the office should not be to the disadvantage of the involved party. This should be particularly true in the decided case in which not a withdrawal attempt of the GPTO failed, because the GPTO never undertook such attempt, and the opponent has actualy made payment of the opposition fee after initiation of the insovolvency proceedings, albeit inevitably after expiry of the opposition deadline. 1. Direct debit authorization (according to SEPA procedural rules). This payment method is the most popular one. 2. Remittance. The deadline is met only if the GPTO receives the money in time. The delay risk thus is also borne by the debtor. 3. Cash payment to the cashier of the GPTO. 4. Cash payment at a bank to the benefit of the corresponding Federal Account of the GPTO. As the payment methods of direct debit authorization and remittance are unpredictable and thus not “save” to meet a GPTO or FPC deadline, the discussed decision and in particular the very gneral official headnote thus has the consequence that careful applicants and their patent attorneys have to pay patent fees (wish can be substantial for large applicants) using less “privileged” routes, namely to use cash only. This cannot be the intention of an important government agency in 2016 ! An innovative solution in addition to a reversal of the decision at the FCJ would instead be to allow payment in the cryptocurrency bitcoin, where a payment confirmation is received within about 60 minutes. The revolutionary CRISPR-Cas9 gene editing method is presently the hottest issue in molecular biology. The scientists Jennifer Doudna of UC Berkely, Emmanuelle Charpentier of the Max-Planck Institute for Infection Biology in Berlin and Feng Zhang of the Broad Institute (jointly operated by the MIT and Harvard University) are regarded as pioneers in this field and areeach involved in start-up companies commercializing the new technology. In parallel a dispute about who owns the IP related to this scientific breakthrough has evolved. Interference proceedings are pending before the USPTO to decide ownership of the technology. Boxall Intellectual Property Management Ltd. The first opponent in the list is the company co-founded by Emanuelle Charpentier for commercializing the gene editing technology, opponent 2 is a Danish biotech company, opponents 3 to 5 are IP law firms and opponents 6 to 9 are patent attorneys from the UK or Germany. It is not unlikely that opponents 3 to 9 are so-called “strawman opponents”, i.e. acting for a different party wishing not to be named in the proceedings. Such strawman oppositions are explicitly allowed under EPO case law and are quite common if the “real opponent” e.g. wishes not to endanger ongoing cooperation with the patentee. Despite much interest of the biotech community in the case, a first instance decision of the opposition division cannot be expected earlier than in about two years, in particular in view of the huge amount of evidence filed by the opponents. a) For the examination of inventive step instructions relating to the presentation of a particular content and thus aiming to influence human imagination or comprehension are not taken into account as such. Instructions relating to information to be reproduced according to the teaching of the invention can support patentability in relation to inventive step only in so far as they determine or at least influence the solution of a technical problem with technical means. b) Claim elements relating to information have to be examined as to whether the information to be presented at the same time forms an embodiment of technical means – not already recited elsewhere the claim – for solving a problem. In such case the technical means for solving a problem have to be taken into account for the examination of patentability. Apple´s well-known and internationally litigated “Slide-to-unlock” patent – being part of the original iphone patents – has been invalidated in first instance nullity proceedings by the Federal Patentn Court. The patentee appealed to the Federal Court of Justice, which on 25 August 2015 rejected the appeal and finally confirmed the invalidation decision of the Federal Patent Court. The grounds for the decision have been published on the FCJ website only now. moving an unlock image along a predefined displayed path on the touch sensitive display in accordance with the contact, wherein the unlock image is a graphical, interactive user-interface object with which a user interacts in order to unlock the device. (5.5) with which a user interacts in order to unlock the device. In its first instance decision the Federal Patent Court found that all claim elements (5.1) to (5.5) would relate only to the presentation of information directed to the user and would not influence the technical functioning of the device and consequently had to be ignored for the assessment of inventive step. The FCJ expressly disagreed with this finding. According the the FCJ the technical problem solved by the invention over the prior art is to provide a more user-friendly unlocking procedure. This technicla problem is solved by the combination of above features (5.1) to (5.5) solving the technical problem of improving user operation reliability by the technical means of optically signalling the unlock path to the user. The court, however, held that features (5.4) and (5.5) do not add any technical matter to features (5.1) to (5.3) which would contribute further to the solution of the technical problem of improving operation relaibility of the unlock procedure and were therefore ignored by the court for the examination of inventive step. Features (5.1) to (5.3) were meanwhile regarded by the court as obvious in view of further reference E7, a video presented at a conference in 1992 showing several virtual operation keys on a touch sensitive display, among them a virtual slider toggle providing the function of the unlocking mechanism according to the patent in suit (“The user can then grab the pointer and slide it to the other side”), albeit not in connection with a mobile phone. 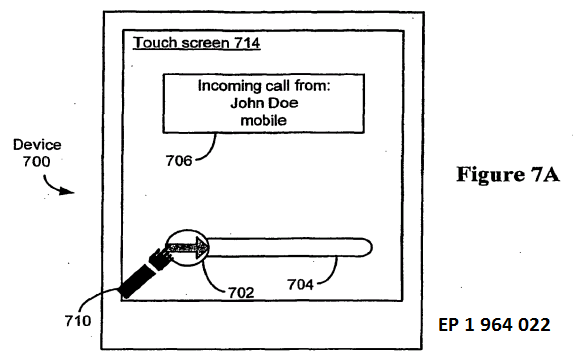 The court, however, took the view that the skilled person would nevertheless apply the refined virtual key functionality disclosed in E7 to the gesture-controlled unlock procedure of the mobile phone with touch sensitive display according to E14, thus rendering the claim obvious of a combination of references E 14 and E7. This judgement equally applied to the amended claims of the several auxiliary requests on file.